The Fourth Group was established in 2016 to shape tech for all, leaving nobody behind. In 2018 we have run campaigns calling for Mark Zuckerberg to appear in front of UK Parliament and for Tim Cook to inform us whether child labour was used to produce the latest line of Apple products. These campaigns garnered the support of over 200,000 people. There is a clear desire for citizens to address new problems caused by tech and hold tech CEOs to account. 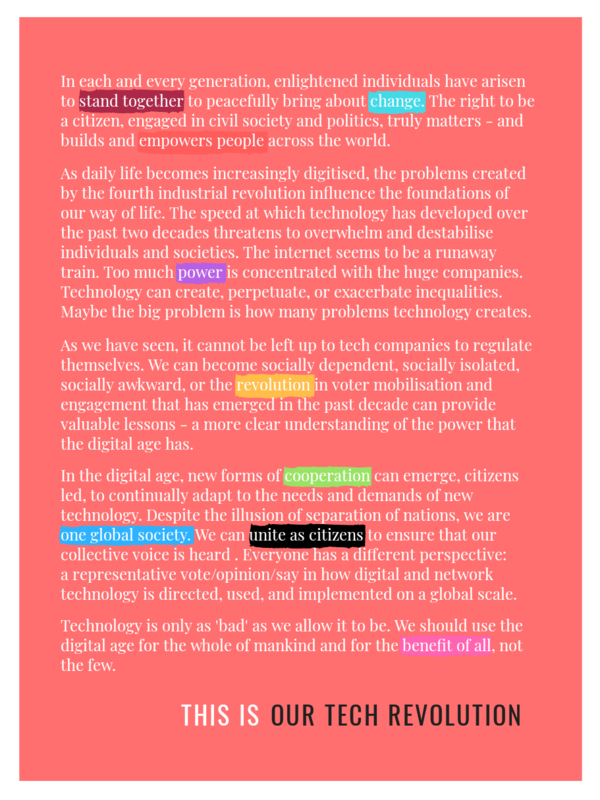 We then organised a global listening campaign to understand what citizens believe are our rights and responsibilities in the digital age, what the biggest problems caused by tech are, and how we address them. The next step is to establish a truly people-led organisation, United Citizens. We have started this crowdfunder to build a membership organisation and build on the start of our campaigns. We want to create a world where those who run it are democratically accountable, and where tech power is held to account. We want to work with Mark Zuckerberg (Facebook), Jeff Bezos (Amazon), Tim Cook (Apple), and Larry Page (Google/Alphabet) to shape the fourth industrial revolution for all, leaving nobody behind. We will unite citizens around the world to build a democratic movement. We will vote for our representatives, then vote for the campaign we want to run, then we will employ campaigning tactics such as lobbying, protest, and community organising to win change. To make this happen, first we must crowdfund. The fourth industrial revolution is being shaped by the few, and is leading to new problems outlined in The Fourth Group's Global Inquiry into Citizens in the Digital Age (www.weareunitedcitizens.org). The fact that the digital world is run by a tiny tech elite. There is no democratically run global institution which represents our interests as citizens of the world. Build a democratically run membership organisation open to all citizens to represent our interests. Influence, campaign, and lobby powerful tech companies. Advocate on behalf of the public and help shape the world from as it is to as it should be. We want to unite citizens globally around common interests for shared peace, privacy, security, freedom, and prosperity. We want to democratise global governance so that people have a say on who runs our world. We will work together to ensure that the fourth industrial revolution leads to progress for all, leaving nobody behind. We are an independent organisation to be run on democratic principles. If we raise enough money, we will organise a global online election to elect our inaugural President and elected officials who will make up part of our inaugural Organising Committee. We will launch a campaign based on the priorities set by our members and representative body. We will support you as members by providing opportunities to campaign on issues we care about. We will also share exclusive opportunities for training, events, networking. To achieve our crowdfund, we need 1,000 people to become founding members for a year. Can you help us make that happen? What will we do with the money if we raise it? 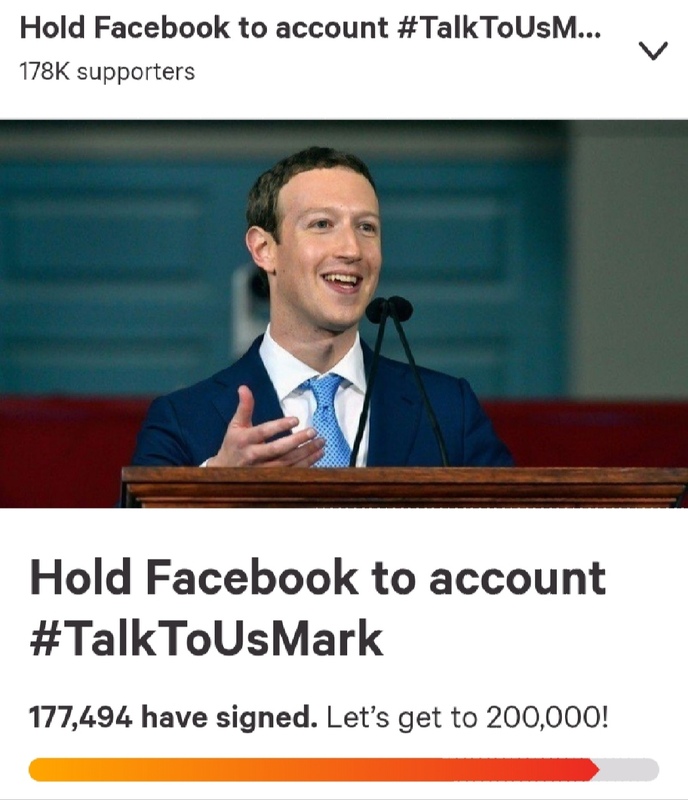 We will organise citizens around the world to run campaigns and hold tech firms and their leaders such as Mark Zuckerberg, Tim Cook, Jeff Bezos, and Larry Page to account. Our first objective will be to organise a global vote and elect representatives of our members. We will then choose a set of issues we want to address based, and launch a campaign in response. If we are unable to raise £40k or more, we will use the funds to kick-start the first phase of United Citizens, which is to vote for our campaign priorities in 2019. We are running this crowdfunder because we believe that a truly independent movement should be self-funded. - Who is the team behind this? - Why do we need a new organisation? The questioning of Mark Zuckerberg by US Congress and the inability of the UK Parliament to summon him to Westminster highlighted the limitations of national governments. - Why is United Citizens a global democratic membership organisation? We believe that people should have the power to decide how the world is run. Democracy gives people that power through the vote. It is global because people around the world are impacted by tech, and the problems demand a global response. - What is different about it? This is not a one-off campaign nor a fleeting movement. Our aim is to build a permanent and powerful institution whose purpose is to represent the interests of citizens on a global level. The organisation itself will employ campaigning and movement building tactics to achieve the goal of people power. - Why should I become a member? We are recruiting members who believe that tech should be accountable to the people. 1. Belonging: You will be part of a global movement, 2. Power: You have the power to vote for campaigns we take on and vote for representatives. You can also put yourself forward for election, 3. Impact: You can help change the world through campaigns, and 4. Benefits: You get exclusive membership benefits such as access to exclusive events and discounts to events and branded merchandise. - What will I be able to do as a member? There are many types of members. You could see your membership contribution as a donation to a cause you believe in. You could also be more active and campaign and help organise the community. You could also run for an elected position. - What campaigns might we run? These will decided by members and elected representatives. Potential campaigns may be inspired by the findings of the Global Inquiry into Citizens in the Digital Age. - How will we campaign? This will depend on the campaigns members choose. There are an array of different tactics and strategies, but the main goal will be to employ actions which help achieve the intended outcome. - When will we elect our representatives and when will we vote on the campaign we take on? If we recruit 1,000 members or more by December 2018, these votes will happen in 2019. - Where is the organisation based? The Fourth Group is registered in the UK. The United Citizens community is intended to be a global community where citizens of the world can organise and campaign. - How is United Citizens politically aligned? United Citizens is a non-partisan organisation. We are not left nor right, we're forward. If you have any questions or would like more information, please email unitedcitizens@fourth.group. Offer available until 23:59 GMT Monday 26 November 2018. All rewards as listed in original £40 1-Year Membership. 1) All rewards included in "1-Year Membership", and 2) passing it forward to someone who cannot afford membership. 1) All rewards included in "1-Year Membership", and 2) passing it forward to two people who cannot afford membership. 1) All rewards included in "1-Year Membership", and 2) passing it forward to five people who cannot afford membership. 1) All rewards listed in other rewards 2) A Patron (Bronze) membership card, and 3) a personalised plaque. 1) All rewards listed in other rewards 2) A Patron (Silver) membership card, and 3) a personalised plaque. 1) All rewards listed in other rewards 2) A Patron (Gold) membership card, and 3) a personalised plaque. 1) All rewards listed in other rewards 2) A Patron (Platinum) membership card, and 3) a personalised plaque.